Dave Splash Dot Com: The Event - "For The Good Of Our Country"
The Event - "For The Good Of Our Country"
Episode 108 of The Event, "For The Good Of Our Country," explores the origins of the relationship between the President and his Vice President, and begins to hint at why the mysterious Mr. Dempsey is doing what he is doing. Just a hint, however. The episode starts with Pres. Martinez personally interrogating the pilot of the plane that nearly killed him, Michael Buchanan. Buchanan has little usable information, except for the fact that he was called and told to "go ahead" with the attack just minutes after a meeting between the president, vice president, and Director Sterling. This, of course, gives Sterling something to work with, and allows him to narrow down suspects to just a handful of people. The results of the investigation lead directly to the Vice President. He made a scrambled phone call to an unknown number just moments after the meeting concluded. He must have either given the order or called the person who did. The VP knows the gig is up, and he nervously calls Dempsey to tell him that he needs protection. They schedule a meeting, but as with most things involving Dempsey, the "meeting" is really an assassination. 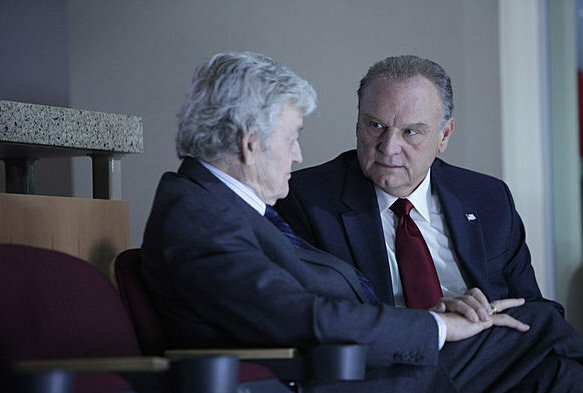 In a flashback scene, we see a meeting between Dempsey and Jarvis where Mr. Dempsey explains to then Senator Jarvis, that for the "good of the country" he should join Martinez's bi-partisan ticket. There is another flashback scene showing the events immediately proceeding the assassination attempt on the president. In it, the Vice President and Director Sterling implore the President not to release the hostages at Inostranka. When the President refuses to budge, the meeting breaks up, and VP Jarvis calls Dempsey to break the news. The assassination is on. Though the attempt failed, the President changed his mind about releasing the detainees. The scramble to find Thomas and Sophia (who everyone assumed was behind the attempt in the first place) initially put the investigation on the back-burner, but since learning that the detainees were not behind it, it became obvious that someone very high up was. Under cover of a doctor's appointment, Jarvis eludes his Secret Service detail in order to make his meeting with Dempsey. Around the time of his arrival, the President summons him back to the White House to answer questions about his suspiciously timed phone call. Dempsey sends Vicky Roberts to "meet" the Vice President. She has already betrayed Dempsey by letting Sean and Leila escape a few episodes back, but this time, the betrayal goes even further. Instead of killing the VP, she kills her partner and lets the VP go free. She tells him that he must reveal the truth about Dempsey. We still don't know too much about Vicky's real motivation (other than saving her son), but whatever it is, Dempsey is definitely on to her now. After leaving Vicky, the VP calls into the White House to confess. Clearly he would prefer a prison cell to being murdered in the basement of an office complex. 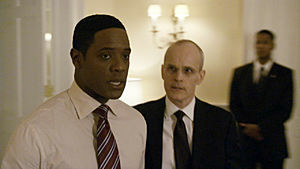 While talking to the President, Jarvis tells him that everything he did, he did because he was manipulated by someone. The President demands to know who. Just as he is about to enter his SUV, a suspicious van pulls up and explodes. The VP is knocked unconscious before he can reveal the name. The rest of episode dealt with Sean and Leila trying to find out what happened to Leila's younger sister. Just as they are leaving the burning apartment building they went to with the reporter, Sean is shot in the arm. It is not a small wound, either, it is one that will require going to a hospital. However, hospitals are required to report all gunshots to the police, and that would result in Sean's arrest, as he still has a murder warrant out on him. Instead of checking in to a hospital, Leila kidnaps a doctor and, at gunpoint, forces him to help Sean. The two go to a pharmacy to pick up supplies, and when they returned Sean was not in the car. Fearing the worst, the two scramble to find him. When they do, he is slumped over in an alley, bleeding to death. Fortunately, the doctor is able to stop the bleeding and bandage the wound. It is also fortunate that the doctor did not report them to the cops as soon as he was freed. I guess he is a better sport than most. The episode ends with the aforementioned "hint" about what Dempsey's true motivation really is. 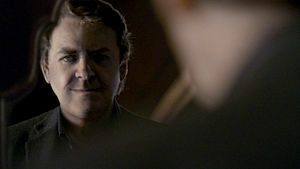 Dempsey is informed about Vicky's betrayal and told about the second attempt to kill Jarvis. He doesn't appear too upset, however. When told, Dempsey was busy taking some form of medication. The last shot of the episode shows Dempsey looking into a mirror and appearing decades younger. We know that the aliens from Inostranka do not appear to age, so one can deduce that the elixir Dempsey is taking to appear younger somehow comes from them. We don't know if it was voluntarily given or if it was somehow extracted from them. My guess, however, is that Dempsey is working with one of the "sleeper" aliens. That might explain why he wants the rest of them to remain in captivity. If word gets out that these aliens have the ability to stop the aging process, then everyone will want it. Perhaps Dempsey wants to horde it for himself, or perhaps he knows this is potentially the most exciting new product ever developed and he wants to be the one who profits from it. There could be billions - even trillions - of dollars to make on something like this. However, the "product" is not ready for human use, as the effect only appears to last a few seconds. Or does it? Maybe Dempsey is secretly 100 years old, and has been using it long enough for him to appear in his 70s - and even younger for a few seconds after each dose. We just don't know enough about him to know for sure. But I'd bet money is major factor in all of this.